Sample the excitement of Glasgow, the grandeur of Edinburgh’s castle, the history of Stirling and the natural beauty of Loch Lomond and the Trossachs. You’ll find these all within an hour’s drive of Red Deer Village Holiday Park. The Park benefits from a secure gated entry system with intercom for immediate entry day or night. As well as CCTV cameras for your complete peace of mind. The level and spacious site is ideal for anyone looking for the ideal base for a holiday in and around West Central Scotland, or as a stopover for a few days whilst touring. Our rental fleet and reception have recently been refurbished inside and out, with our chalets exteriorly re-cladded – a new, more energy-efficient solution rather than annual painting maintenance. There are 12 hardstanding pitches with electric hookup, and 14 hardstanding pitches with electric hookup surrounded by our grass area, with tent pitches available also. The new secure entrance system to the park is now complete and fully operational. Coded access allow visitors and residents piece of mind and a safe and secure environment for their stay. CCTV cameras are also operational at our entry. Our Wi-Fi service is free to all guests staying at the park! Information on our Wif-Fi is available at reception. We are delighted to announce that following an inspection from the Scottish Tourist Board in October 2018 we have retained our 5 star rating status. The Directors and staff are delighted with this award and will continue to ensure that the Holiday Park is maintained to that high standard. 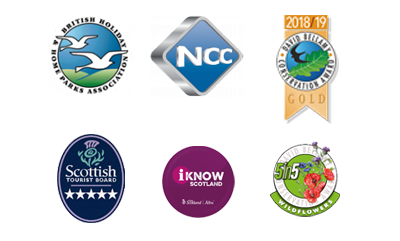 We have also now received the iKnow Scotland Award, ensuring a range of information about the local area is available to all visitors to the park.